President Recep Tayyip Erdogan on Saturday said Turkey would impose sanctions on two US officials as retaliation for a similar move by Washington, hitting back in an unprecedented row between the NATO allies. Turkey's holding of pastor Andrew Brunson on terror-related charges for almost two years has sparked one of the most intense crises between Washington and Ankara since the Turkish invasion of Cyprus in 1974. He did not specify to which members of the US administration he was referring. [post_ads]The US attorney general is Jeff Sessions and while the United States does not have an interior ministry similar to Turkey, the Secretary of the Interior is Ryan Zinke and Secretary of the Department of Homeland Security is Kirstjen Nielsen. Erdogan's announcement was a response to Washington's decision to impose sanctions on Turkish Interior Minister Suleyman Soylu and Justice Minister Abdulhamit Gul over Brunson's detention. Turkish ministers have denied having any assets in the US and it is highly unlikely the American officials would have assets in Turkey. But analysts say the sanctions are still of critical importance. "Although it is unlikely the sanctions will have much practical effect in either case, it is significant and unprecedented that two NATO allies have sanctioned members of each other's government," Amanda Sloat, a former State Department official and now a senior fellow at the Brookings Institution, told AFP. The Turkish lira, which has plunged in value this year, has already reached the five to the dollar mark for the first time in history over the sanctions. 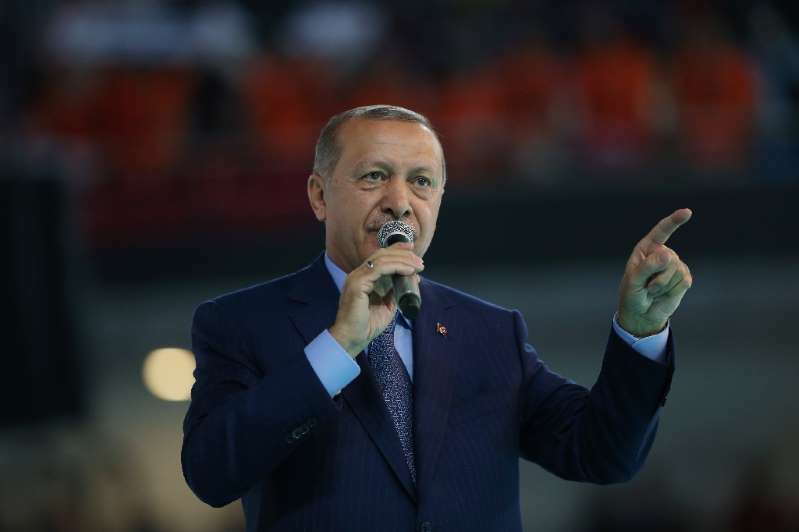 "There is a risk of more sanctions to come... which could hit more directly at the heart of Turkish government interests and which have the potential to cause a run on the lira," Anthony Skinner, director of Middle East and North Africa at risk management consultants Verisk Maplecroft, told AFP. He said the "Achilles' heel" of Turkey's fragile economy was its exposure to foreign portfolio investments and credit. And Erdogan appeared to indicate that he did not want the crisis to escalate further to full-scale economic sanctions. The US Treasury implemented the sanctions against the Turkish ministers under the 2016 Global Magnitsky Act named after Russian lawyer Sergei Magnitsky, who died in a Moscow jail, and which allows the US to sanction foreign officials implicated in rights abuses. The dispute is just one of a long list of problems in relations between Ankara and Washington, including Turkey's cosy ties with Russia and the failure of the US to extradite the alleged mastermind of the 2016 failed coup Fethullah Gulen. Two Turkish employees of US consulates in Turkey are also currently in jail on terror charges and another is under house arrest. "Given the high economic stakes for Turkey, some kind of agreement is more likely than not," said Skinner. "Erdogan has an unrivalled track-record of playing with fire, but he too knows when he has tracked too far across the coals." Sloat argued "quiet diplomatic negotiations" were the best solution since "Trump will not back down until Brunson is home, while Erdogan does not want to look like he capitulated to the Americans".